Michelle Obama's tearful final speech will give you hope for the future of our country. Michelle Obama gave her final speech on Friday, fighting back tears to deliver a message of hope that will hopefully carry us through the next four years of the Trump presidency. 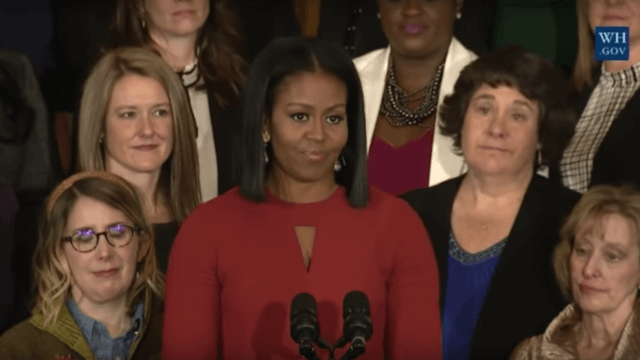 The occasion, honoring the 2017 School Counselor of the Year, was a fitting one, as the First Lady spent her eight years in the White House working tirelessly to improve the U.S.'s public education system with various initiatives. And Obama had an inspiring message to send out to all the young people in the country who were watching. "If your family doesn't have much money, I want you to remember that plenty of folks, including me and my husband, started out with very little," the First Lady said. "But with a lot of hard work and a good education anything is possible, even becoming President. That's what the American dream is all about." The speech sent a message of deep gratitude for the tireless and under-appreciated work that educators do. "I want to close today by simply saying thank you," Obama said, through tears. "Thank you for everything you do for our kids, and for our country. Being your First Lady has been the greatest honor of my life, and I hope I've made you proud." Obama recognized that it's often all too easy to get bogged down by the frustrations and setbacks of daily work, and too tempting to think our efforts won't make a difference. But she raised up that hard work as the essential product of hope, challenging all of us to see our daily lives as an opportunity to put our wildest dreams in motion: "That is what moves this country forward every day: our hope for the future, and the hard work that hope inspires."